This is a subject matter driven course, based in the main, on an ongoing series of work called "The Force Majeure" in which the Harrison Studio is engaged. It is the subject matter, as it emerges from research, observation and discourse, that determines the media, digital and otherwise, that will express the meaning and intention of the work. 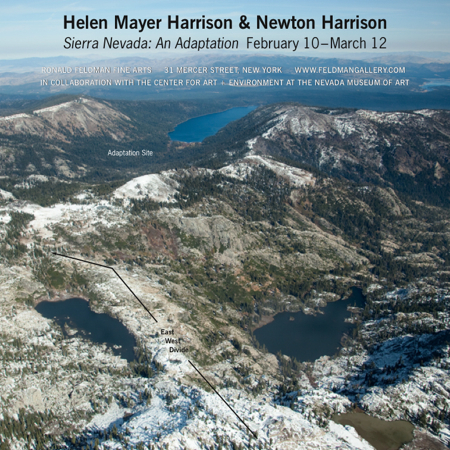 It is entitled “The Force Majeure: THE SIERRA NEVADA: AN ADAPTATION.” We use the term “whole systems” in the sense that the approximately 22,000 square mile mountain range can be understood geo-physically, and originally ecologically, as a whole system. The fundamental subject matter is the coming ecological, social and political turbulence that will come about as the temperature in the mountainsides and the high grounds rises. If predictions are accurate, the whole region will experience a profound loss of its species, both natural and cultivated. Paleoclimatological research done on this campus by the Paleoclimate and Climate Change Research Group (CCIL) indicates that the low grounds will experience rising temperatures during the next 50-100 years of around 5-7 degrees Fahrenheit. Furthermore, the high grounds in much of the Sierras will experience a temperature raise between 7-10 degrees Fahrenheit. This course of events suggests that there will be both a botanical, in terms of natural ecosystems, as well as a farming or cultivation systems die-off of between 60% and 70%, perhaps more. The Harrison Studio, for this work, will pose two questions, simple in their statement, complex in their enactment. What do we think we can do about this state of affairs and how do we go about it? The students who engage will be called on to research and assist in diverse ways the formation of this piece. To do so, the first few weeks of the group project will be familiarization with the Harrison Studio process of work, which from many perspectives, is unorthodox. For instance, we tend to design backward from a highly probable event structure that is, in good part, catastrophic. The design looks for and begins to work out how we might get from a “now,” which is the Holocene, the current 10,000 years of more or less stable climate, to the Anthropocene which is the climatological destabilization brought on by human behaviors that is becoming so apparent in the “now.” The reason for working backward from a near and highly probable future is that our present “now” does not have embedded in it, the legal, political and socially consensual properties that would permit smooth transition from the Holocene to the latter. This being the case, the transition is likely to be far more chaotic socially and ecologically stressful with an attendant extinction of species and even loss of human life that now looks more probable than it may need to be. 2. The inventing of strategies and processes that will generate a trans-watershed discourse on it’s own future wellbeing. The researchers that the project will be working with are members of the University of Nevada and Warren Sack of DANM, whose basic research is large conversations. The Harrison Studio only proceeds at this scale by invitation. Typically people who engage in the studio work and add serious creative content are acknowledged and cited in the work as co-creators (see “Santa Fe Watershed: Lessons from the Genius of Place”) The students in this project who engage in support of this work, over the course of the year, will have three possible outcomes available to them. The first is that they in fact take up an issue in such detail that they do become co-creators. The second is working in the studio may set off the conditions for creating the subject matter for their own MFA, or they might produce a critical paper. Finally, the core belief that the studio operates with is that the cultural landscape and all that we see in it and all that is happening in it is the outcome of the desire, intention and will of the people in power in a place or a subsystem. Underlying this belief is the notion that forms in the cultural landscape come about as a result of people in position of power often, though not always, seeing opportunity and acting for advantage. This begins with storytelling behavior, which then turns into propositions or structures, which in turn become the ever-changing fabric of the cultural and now natural landscape. The strategy for change employed by the studio is to pick up on the core narrative of place, come to some understanding and to veer an existing dysfunctional narrative, for instance as manifested in many parts of the Sierra Nevada, into a more viable social and ecological state, which in turn establishes grounds for redesign in the face of coming turbulence.